Our paper titled “Optothermally Controlled Charge Transfer Plasmons in Au-Ge2Sb2Te5 Core-Shell Dimers” is published in the Plasmonics journal. 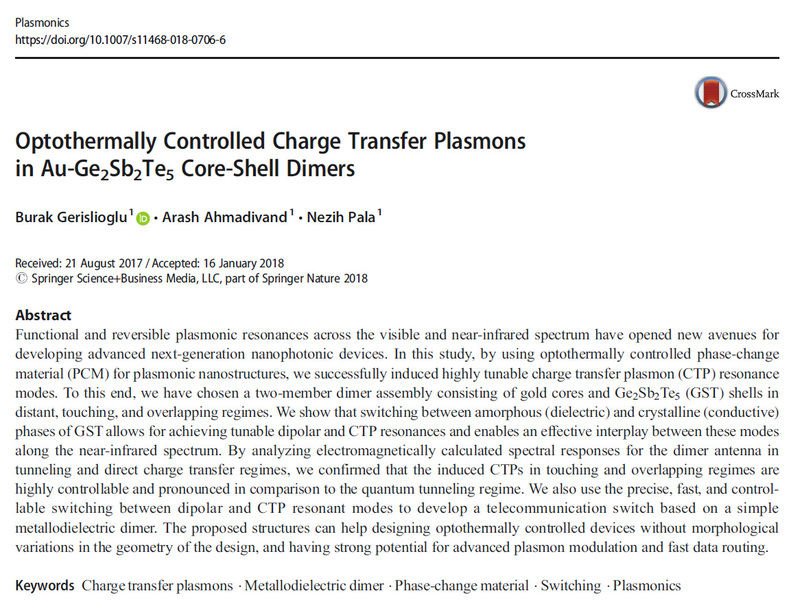 In this study, by using optothermally controlled phase-change material (PCM) for plasmonic nanostructures, we successfully induced highly tunable charge transfer plasmon (CTP) resonance modes. To this end, we have chosen a two-member dimer assembly consisting of gold cores and Ge2Sb2Te5 (GST) shells in distant, touching, and overlapping regimes. We show that switching between amorphous (dielectric) and crystalline (conductive) phases of GST allows for achieving tunable dipolar and CTP resonances and enables an effective interplay between these modes along the near-infrared spectrum. By analyzing electromagnetically calculated spectral responses for the dimer antenna in tunneling and direct charge transfer regimes, we confirmed that the induced CTPs in touching and overlapping regimes are highly controllable and pronounced in comparison to the quantum tunneling regime. We also use the precise, fast, and controllable switching between dipolar and CTP resonant modes to develop a telecommunication switch based on a simple metallodielectric dimer. The proposed structures can help designing optothermally controlled devices without morphological variations in the geometry of the design, and having strong potential for advanced plasmon modulation and fast data routing.